Use your matte board cut-outs for purposes such as mounting pinholes and making exposure calculators. Print the image above and paste it on a piece of matte board (or other cardboard). Then click here (or on the image above), print the center dial of the calculator, paste it onto another piece of board and cut it into a circle. Attach the center dial to the calculator with a brad or thumbtack For a truly permanent calculator, dry mount the images to matte board or laminate them in plastic. 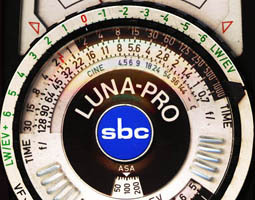 When you take a meter reading, rotate your calculator until a convenient f-stop on the outer ring lines up with the recommended shutter speed on the first inner ring of the dial, then go to the effective f-stop of your pinhole and read the correct exposure for the type of film you are using. See the example below: if your meter shows the correct exposure to be 1/2 second at f/16, and your pinhole has an effective aperture of f/360, your reciprocity-failure-corrected exposure for T-Max 100 would be 8.5 minutes, and development should be decreased to N-1½. Note that even though Tri-X is usually rated two stops faster than T-Max 100, at exposures above 15 minutes T-Max 100 is actually faster. I rate T-Max 100 at 80 and Tri-X at 320. There is an empty circle on the calculator so you can fill in times for another film. If you don’t have a light meter and wish to estimate your exposures, see my article on Estimating Exposure. You may make one of these exposure calculators for your own use, but commercial reproduction is prohibited without express permission from Ed Buffaloe. Read the values recommended by your exposure meter for a given scene. Set those values on the calculator, then refer to the effective f-stop of your pinhole for a reciprocity-compensated exposure time.